A remarkable leader who once resided here, this First World War military nurse and then Assistant Matron-in-Chief was awarded the Royal Red Cross (First Class) in 1917. As Matron-in-Chief of the Royal Canadian Medical Corps during the Second World War, she was responsible for thousands of Army nurses, and assisted in the formation of the Royal Canadian Air Force and Navy nursing services and the Canadian Women's Army Corps. 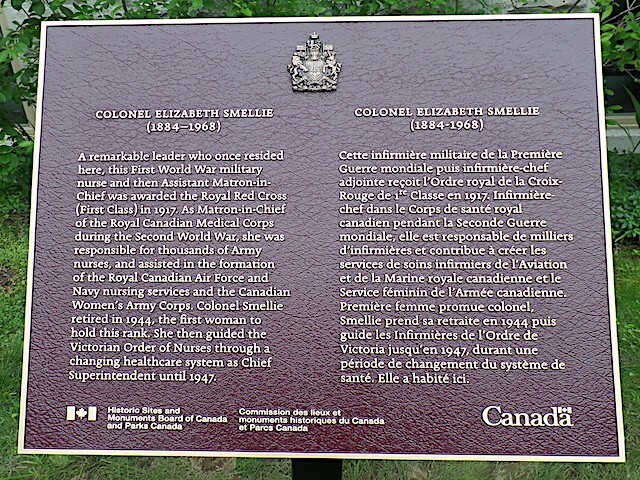 Colonel Smellie retired in 1944, the first woman to hold this rank. She then guided the Victorian Order of Nurses through a changing healthcare system as Chief Superintendent until 1947.